Blog The Holidays Are Here! Make the holidays even happier with November’s Promotions from Young Living! Whether you patiently put off holiday celebrations or rush into the festivities, the November PV promotion is here to help you get in the spirit of the season. 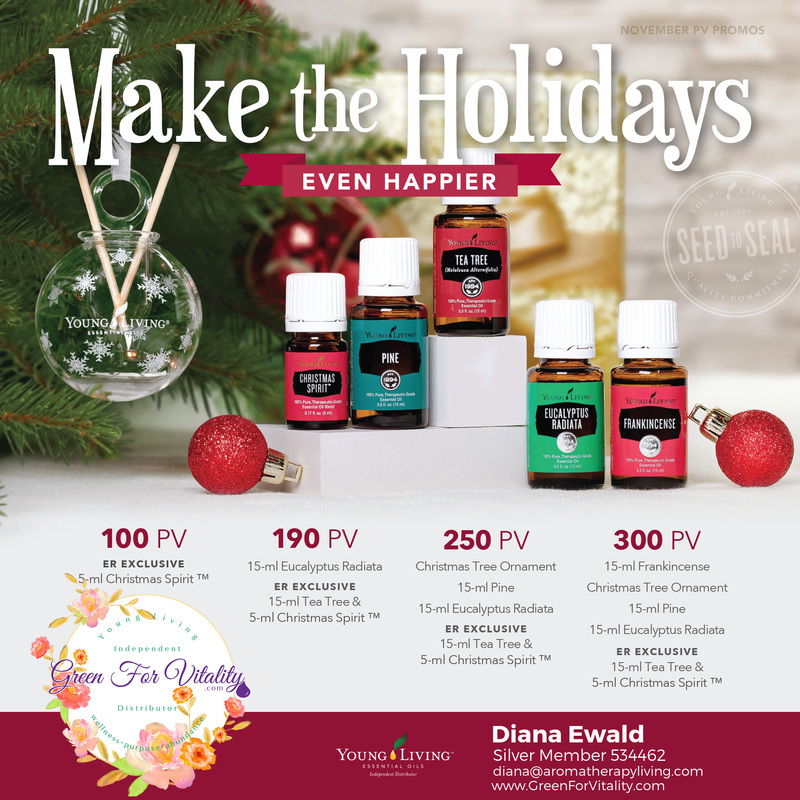 Among other goodies, your qualifying order comes with Christmas Spirit™, Pine, Eucalyptus Radiata, and Frankincense – essential oils that are perfect for the holiday season! 15ml Frankincense: With Biblical ties to Christmas, Frankincense is a wonderful oil to elevate the spirit of the season. Apply its uplifting aroma by massaging it into your chest, temples, or neck. 15ml Pine: Bring the freshness of the forest inside! Pine is the perfect complement to your real or artificial tree when you diffuse the woodsy, rich aroma throughout your home. 15ml Eucalyptus Radiata: Fill your home with the crisp, clean scent of Eucalyptus Radiata just in time for holiday guests! Diffuse it on its own or with complementary oils such as Orange, Lavender, and Rosemary. Bonus Essential Rewards Exclusive: 15-ml Tea Tree Essential Oil*: Prep for holiday hosting with help from this home cleaning must-have. Use Tea Tree for DIY linen spritzers, household cleaners, and air fresheners to keep your home cozy and comfortable. NEW Bonus Essential Rewards Exclusive: 5-ml Christmas Spirit™ Essential Oil Blend: It doesn’t feel like the holidays until you bring out the Christmas Spirit! A YL exclusive, this warm, nostalgic essential oil perfectly blends Orange, Cinnamon, and Black Spruce. *Members in APO/FPO/DPO areas need to call 1.844.760.2123 to place their order. Because Frankincense and Tea Tree are listed on the dangerous goods list, members in these areas will need to call to receive ER points in place of the oils. Assistance will be available November 1-30, Monday–Saturday, 8 a.m.–8 p.m., MT. **Christmas ornament is fragile; handle with care. Have questions? Contact me any time!